It’s that time of the year again. 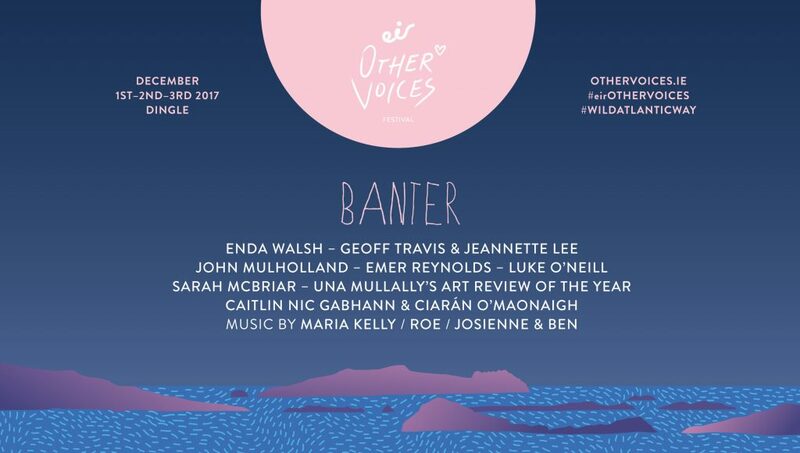 As we’ve down annually since 2012, Banter heads to the Kingdom for Other Voices and takes over the back-room of Foxy John’s in downtown Dingle for the weekend where we are joined by a fine cast of talkers, makers, do-ers and players for some conversations and music by the fire. We’ll be open for business next Saturday and Sunday, December 2 and 3, from 2pm to 6pm and admission is free. Please note that capacity is limited so get there early if you want a seat or standing room. We’ve been trying to bring Enda to Dingle since we started this odyssey and, joy of joys, he’s finally not got stuff to do in Luxembourg, Hong Kong, London or New York. The playwright talks shop, collaborations and stagecraft. A total honour to welcome the pair behind the legendary Rough Trade Records to Dingle. A welcome return to Banter for The Observer editor, John has spent much of 2017 as Acting Editor of The Guardian US so he’s ideally placed to let us know what the hell is actually happening across the Atlantic right now with yer man Trump. The woman behind The Farthest, one of our favourite film experiences of 2017, discusses space, film-making and dark skies in Co Tipperary. A deep dive with the chair of biochemistry at Trinity College Dublin and one of the world’s leading immunologists in what the world of science is doing for us all. The founder of the AVA electronic music festival in Belfast, one of the best new European events in recent times, tells us her story. What it says on the can: the year in film, theatre, music, books, TV and whatever else comes to mind as narrated by Banter’s most popular repeat visitor. Unmissable. She’d better big up The Florida Project….